This is a first! A Russian watch on WahaWatches. A lot of professional watchmakers don’t accept Russian watches. Either because the parts are hard to find or because the movements can be a bit flimsy. However, it’s my experience that Russian movements perform quite well despite them being cruder than Swiss counterparts. You can buy a lot of parts on eBay if you need any. This watch is a Start with a ZIM 2602 movement, similar to the LIP R-26. The ZIM has 15 jewels and no shock protection system but it does have a Breguet hairspring, just like the French movement it was based upon. The upper part of the case with the lugs, bezel, and crystal is one part. The case back with a recess for the movement is another part. The movement with the dial is directly fitted inside the case back. Turn the movement around and lift the cannon pinion. You can’t remove the center wheel later if you don’t include this step. Lift the wheel-train bridge and remove the escape wheel, the 4th wheel, and the 3rd wheel. 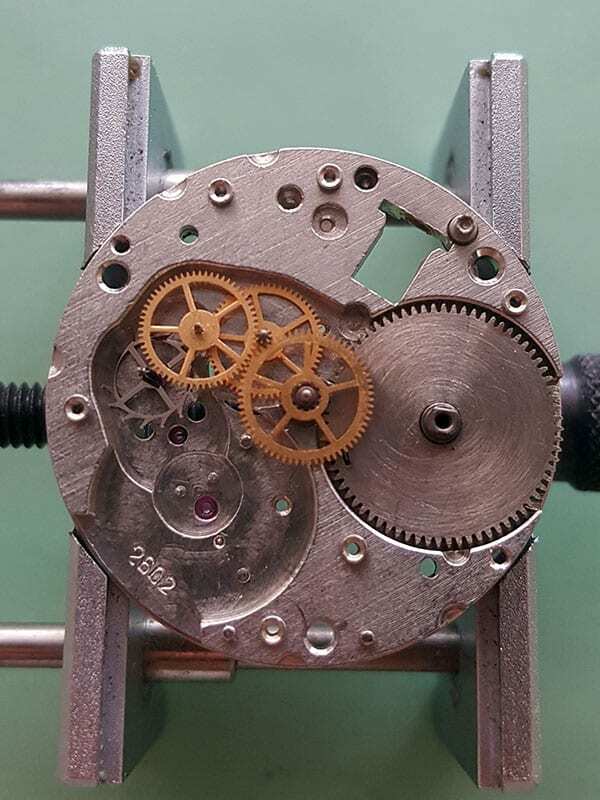 As you can see, the center wheel is covered with the barrel bridge in this movement. Remove the ratchet wheel and the crown wheel. Often, the crown wheel is secured with a screw with a left-hand thread. In this case, they’re 2 smaller regular screws. Lift the center wheel and finally the barrel. Don’t forget to remove the capstone for the balance. 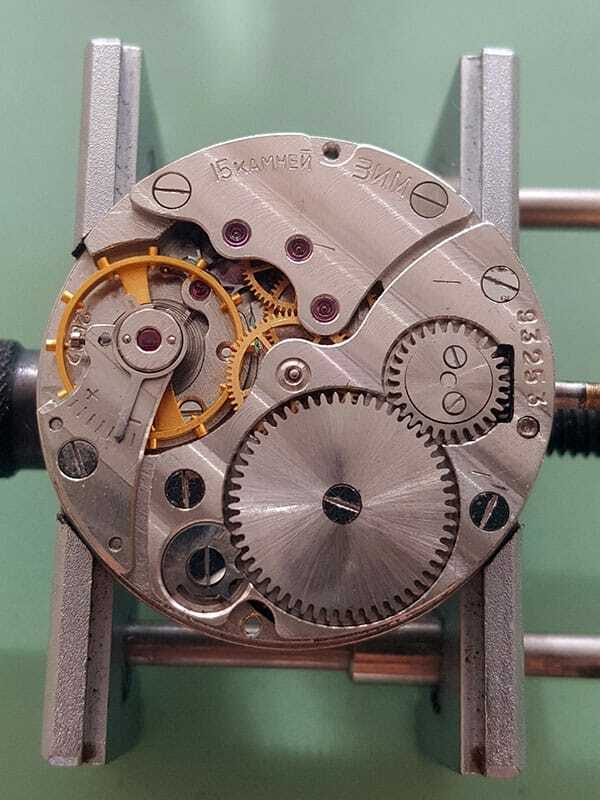 This ZIM 2602 movement has an extra intermediate wheel between the setting wheel and the minute wheel. Start with the capstone for the balance on the bottom plate. Turn the movement around and fit the barrel and the wheel train. Don’t forget to fit the escape wheel and the third wheel first. Then fit the fourth wheel and the center wheel. Remember that the two smaller screws for the crown wheel are regular screws. Do you have a similar watch with a ZIM 2602 movement or one of the other versions? Let me know in the comments below.